Taco LoadMatch®Twin-Tee® fittings assure the comfort and performance of LoadMatch® single pipe hydronic systems and primary secondary two-pipe hydronic systems. 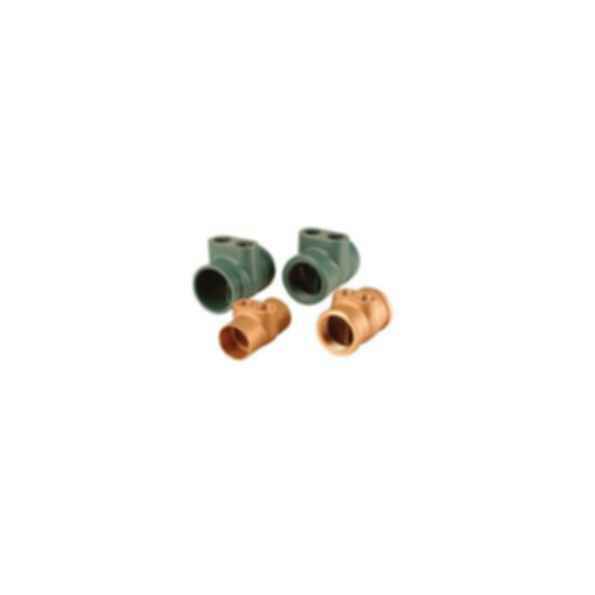 The patented Taco Twin-Tee® is designed to replace the two primary circuit tees used to connect a secondary piping circuit to a primary piping circuit in a hydronic system. The Twin-Tee® also ensures that the secondary piping circuit is decoupled so that the flow in the secondary circuit, when the secondary pump is off and the primary pump is on, is zero. This also ensures that the flows in other circuits are not affected by the operation of the secondary circuit pump. In addition, an internal baffle between the secondary circuit supply and return connection prevents any short circuiting of secondary fluid from the return to supply connections. Taco Twin-Tees® reduce the number and cost of fittings and field joints required in a system, to save you money and installation time. Multiple Connection TypesSweat, Threaded, Grooved.